Keep reading to find out more about how scientists are learning to use these viruses to treat certain kinds of cancers. The title of the paper that inspired this post is “Vesicular stomatitis virus oncolysis is potentiated by impairing mTORC1-dependent type I IFN production.” This is a free PMC article, meaning that you can go download or view it here without having to pay for it. 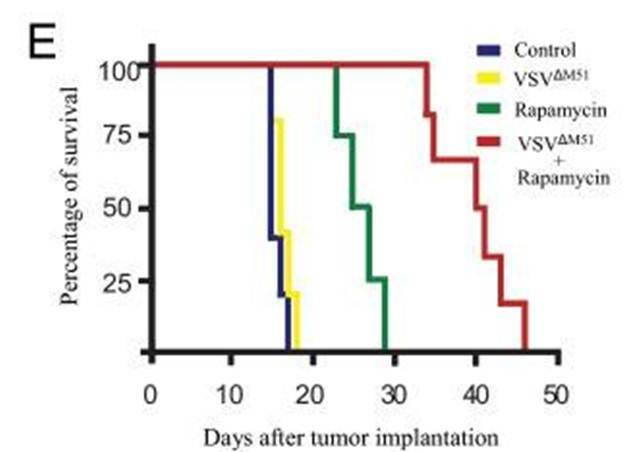 In this paper by Alain et al, researchers combined the use of an accepted chemotherapeutic agent, Rapamycin, with vesicular stomatitis virus (VSV) to see if this combination approach would target specific types of tumor cells known as malignant gliomas. 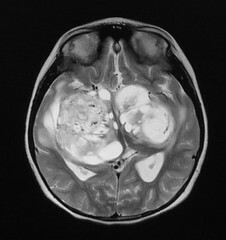 A malignant glioma is an aggressive form of brain tumor that does not respond well to current therapeutic protocols. But why use this particular chemotherapeutic agent? Why would you want to combine Rapamycin (a known immunosuppressant) with viral therapy? As it turns out, prior work from other groups showed that the mTOR pathway is a major tumor promoting, or oncogenic, pathway that is deregulated in malignant gliomas. One of the functions of mTOR (and there are very, very many functions of mTOR) is the regulation of type 1 interferon (IFN) production. Interferons are a part of our innate immune response and one of the major defenses against viral infection. Due to the way that mTOR is deregulated in these tumors, gliomas are more sensitive to mTOR inhibitors such as Rapamycin than the normal cells around them. Treatment of malignant gliomas with Rapamycin then means that these cells much less interferon in response to viral infection compared to healthy cells. This is critical, because it establishes a cellular niche that is unique to the cancer cells and not the healthy cells elsewhere in the body. This last point it what the authors of this study exploited by the clever use of a mutant strain of VSV. This strain, named VSVΔM51, is much more sensitive to interferon than the wild type virus, and therefore it will only grow in cells that have a significantly impaired interferon response. By using Rapamycin to target mTOR in the malignant glioma cells, these authors were able to reduce their interferon response far below the normal healthy cells surrounding them. Rats intracranially implanted with malignant gliomas were given Rapamycin and infected with VSVΔM51 6 days after the introduction of the tumor cells. Researchers then monitored how well the rats responded to the treatment. 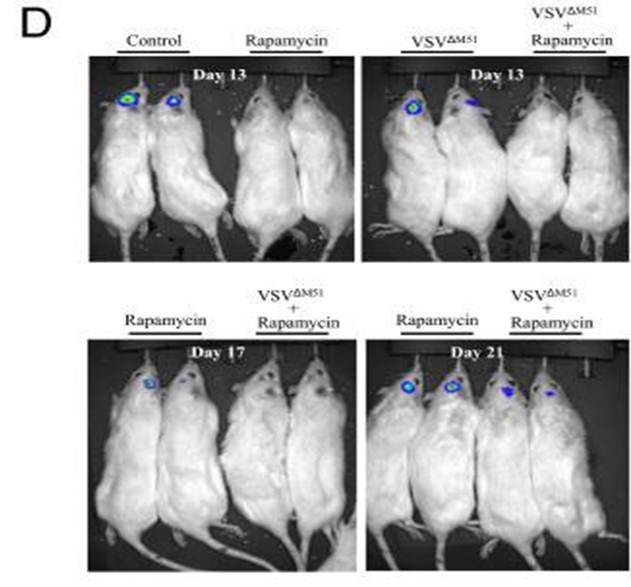 As you can see below in figure 2E, rats treated with the combination of VSVΔM51 and Rapamycin survived significantly longer than rats given either treatment alone or control mice. (E) Kaplan-Meier survival curve. Control median survival, 15.6 d; VSVΔM51-GFP, 16.4 d; rapamycin, 22 d; VSVΔM51-GFP + rapamycin, 39.8 d. Control and VSVΔM51-GFP log-rank test, P = 0.2402; control and rapamycin log-rank test, P = 0.0038; control and VSVΔM51-GFP plus rapamycin log-rank test, P = 0.0007; rapamycin and VSVΔM51-GFP plus rapamycin log-rank test, P = 0.0011. By using an engineered form of malignant glioma cells expressing the luciferase protein (a bioluminescent, or light producing protein) they were able to track the size of the tumors and their response to the different treatments in live rats. In figure 2 D below, you can see that rats treated with the combination of Rapamycin and VSVΔM51 have reduced tumor volume and slowed recurrence compared to Rapamycin treated animals (the tumors show up as the blue coloration in the heads of the rats). (D) On d 0, rats were intracranially implanted with RG2 rat glioma cells expressing luciferase (RG2-Luc; 1 × 104 cells). On d 6, rapamycin (5 mg/kg) was administered by i.p. injection for 10 d. Control rats received vehicle only. On d 7, VSVΔM51-GFP or PBS solution was administered by i.v. injection (MOI of 5 × 108 pfu). Photograph showing the luciferase expression of RG2-Luc tumors at d 13, d 17, and d 21 from representative rats of each group. While this is not a definitive cure (the rats did all die, after all), it does significantly extend the life of rats given this treatment compared to just Rapamycin alone. One thing we have to remember about treating cancer in humans is that “cure” in the sense that we normally understand it is a very rare thing. In many cases the best we can do is achieve remission and extension of healthy years before relapse or recurrence. These studies show that there may be value in using specifically engineered oncolytic viruses in combination with drugs that alter the immune signaling of cancer cells. While it will be a long time before we see anything remotely like this being used in human cancer patients (and for good reason, there are many potential dangers!) it is promising to see that there are novel therapeutic approaches being developed for the treatment of resistant solid tumors such as malignant gliomas. Over the next few decades it will be interesting to see what arises from the field of pharmacoviral oncology. 1. Alain, T. et al. Vesicular stomatitis virus oncolysis is potentiated by impairing mTORC1-dependent type I IFN production. Proceedings of the National Academy of Sciences of the United States of America 107, 1576–81 (2010).